It has been said that the small children are more sensitive to the paranormal and have not learned to “block” what others have as they grow older. As reports come into us to be posted in the Ghost Log, we have noticed a few that stand out are those made by small children. Many reports come in. Somehow when a small child tells you they saw a something they didn’t quite understand you pay very closer attention. These are those reports. On September 15, 2006, a patron came to the Front Desk and reported to a staff member that her daughter had seen something. That staff member came to find me, and I went to talk to the woman and her daughter. We sat down and you could see they were both very uneasy. I asked what had happened. The mother said that she and her daughter had been in the library 10 days earlier, and that her daughter was in the Ladies restroom and was in the handicapped stall. She went in and saw there a “mean face” and came out to find her mother. I asked the little girl, who is about 7, to tell me just what she saw. She repeated just what her mother said. She would just say “I saw a mean face”. I reassured the mother and daughter that we have never had anything bad happen here. We have had noises and things fall, the alarm gate would sound off, even heard a voice now and then, but nothing bad. I also told them if they ever felt scared or uncomfortable, please come and tell us. They have returned to the library since. The Head Librarian was Carla Hardy. She reported that her 3 year old grandson Xander had been in the library for a visit. As they walked over by the Youth Services desk Xander stopped and looked down along the stacks to the back of the library. He cocked his head one way then the other. All of the sudden he said “The man went bye-bye.” No one else saw a man in or around the area. We were working the Saturday shift. I took a phone call from a patron, one of the Storytime moms. She said about a month ago she and her four year old daughter were in the Multi-Purpose Room alone either before or after Storytime. She said all of a sudden her daughter got a strange look on her face. The little girl said “He doesn’t have any legs.” The mother said she knew the girl was seeing something, she just wasn’t sure what. She had hesitated to come forward and tell us, but that her friends urged her to, so she did. She said they are coming back to Storytime. I was in the library with my 4 year old son, and we were coming out of Storytime. My son walked up to Ellie and said “I don’t like that lady on the stairs, she is scary” he said. “What lady?” I asked, “a librarian?”, “No” he said, “she freaked me out.” I asked him what she did to freak him out and he said he didn’t know, she just really freaked him out. I asked him to show me where she was and he brought me to the stairs by the multi-purpose room and pointed up to the top. He said she wasn’t standing on the stairs, she was just on there. There was no one there. I asked if she was doing anything, but he said, no, she was just standing there and really freaked him out. He said she had glasses. We feel the Ghost Walks are an introduction to the paranormal. For many, this will be their first glimpse into an actual investigation. There are countless varieties and techniques to do an investigation, ours is just one of many. When doing a tour, we generally have around 20-25 patrons in each Ghost Walk. Because of this factor, you will find there are varying levels of expertise on the subject. From the novice to the expert, we never know what we will get. Many patrons come prepared to share stories and occasionally they bring evidence from previous walks. We provide our own “ghost gadgets” for a few of the patrons to use. Our hope is that as many patrons as possible can have that first hand encounter. Those that have become more interested in the subject usually bring their own ghost gadgets to work with. You might see KIIs, EMF detectors, infrared cameras, ghost boxes, etc. Depending on the dedication (and budget) of the patrons, we see lots of interesting devices. Cameras and cell phones are the most common. Many patrons download ghost hunting applications (apps) to their cell phones just for these events. The most often used is the TAPS APP. 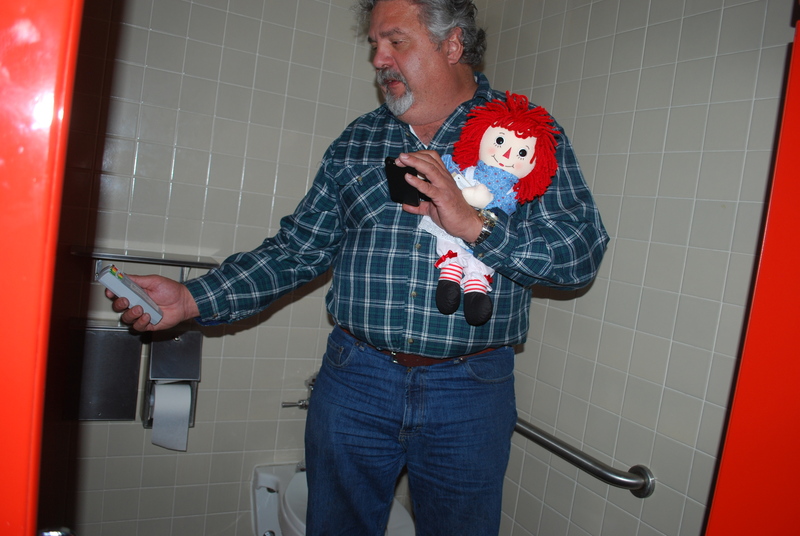 It was created and made available by the TAPS (The Atlantic Paranormal Society). The app contains a functioning Electro Magnetic Field (EMF) detector, a Geophone to sense the slightest vibrations, and a digital recorder for capturing Electronic Voice Phenomena (EVP). Many apps are available online. Different reports come to us from the attendees of their experiences during a Ghost Walk. We have yet to have a walk where nothing happens at all. 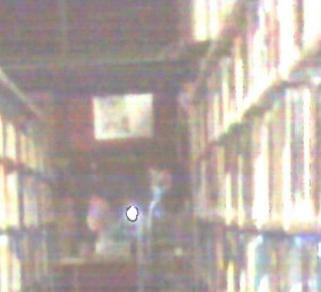 There always seems to be some type of activity whether KII’s sound and light up or someone sees shadows in the stacks. It is always interesting and ever changing. In the last couple years several women have reported the feeling of a child taking their hand and walking along with them. This is usually women that are mothers. It seems that the children ghosts are able to tell which woman have children and which do not. One father also gave us the same report that he felt a child was walking with him. Two staff members reported seeing a young boy crouched down as if hiding during a walk and a young girl was spotted darting down the stacks on another. Tiny little lights have been known to move about the stacks. On rare occasions an attendee has reported they feel suddenly light headed and somewhat ill. I myself have had this happen once in the Ladies Room. It is a very disconcerting feeling. As soon as the person leaves the area it is gone. I always like to make it clear that we do have activity here but I have never felt afraid. Yes, I have been startled or surprised, but in the 23 years I have worked here I have never felt unsafe. Some of the employees have never had any encounters and then there are those of us that seems to have the majority of activity. For me, I do not try to” block” nor do I “call them in”. If you do attend one of the walks, we ask that you keep an open mind and try to bring good and positive energy. It truly makes a difference. For more information on the haunted library call or stop by the library. *Photo of Senator John Hastert during a Ghost Walk.